“It must be so much fun to be her”, my husband said to me. My daughter had been singing her heart out in the shower, like a little girl should. She was completely free of cares and worry. Meanwhile, I was preoccupied with all the things that still needed to get done that evening. My to-do list loomed large in front of me like a giant that stood in the way of enjoying anything carefree. These past couple of weeks, we’ve been slogging our way through homeschooling. Sending my kids off on the big yellow bus would have been more than a little satisfying, to be honest. I eventually realized an important element was missing from our daily routine. I had become more focused on discipline, lesson plans and managing a home, than delighting in my children. Sometimes I’m so busy being the Mom- teaching them, disciplining them, sheltering them, doing things for them- that I don’t take time to stop and simply delight in them. In who they were created to be. And for what purpose. Can you relate? 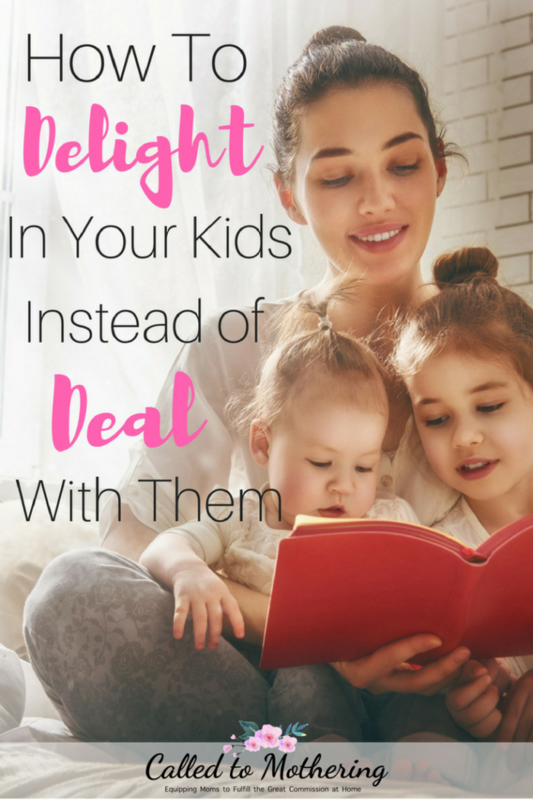 It is possible to move beyond just dealing with your children to actually delighting in them! That one simple comment from my hubby reminded me of something I had taken for granted- that our kids are unique individuals, instead of extensions of ourselves. It’s part of why parenting is so unbelievably frustrating and difficult at times, but also why it can be exhilarating at others. My children, though born into the same family, are drastically different from each other. Our son is my problem solver. Inquisitive and curious, he usually takes something apart to figure out how it works. He’d rather stay inside and read a book or watch tv when given the choice to spend time outdoors. Our daughter, on the other hand, is my animal and nature lover. She jumps at the chance to go outside and examine every bug and wildflower in our yard. While my son flourishes when I spend quality time with him but shies away if I try to give him a hug or kiss, my daughter enjoys climbing up in my lap and snuggling in close. I am free to plant all the kisses I want on her. One of the greatest joys of motherhood is looking into the faces of our children, and knowing we’re staring at a miracle. But somewhere along the way, we get used to all the to-do’s of mothering, instead of enjoying each child as they were uniquely designed. Study up on their individuality, and let it inspire you to take joy in how they were created for a special purpose. The Bible says God lavishes love on us (1 John 3:1). When was the last time we lavished love on our kids? Shut our phones off, closed the laptop, walked away from the piles of laundry and the stacks of dishes, and went somewhere to have fun with them just because? The best moments with my children is when I put my schedule on the back burner and spend quality time with them. 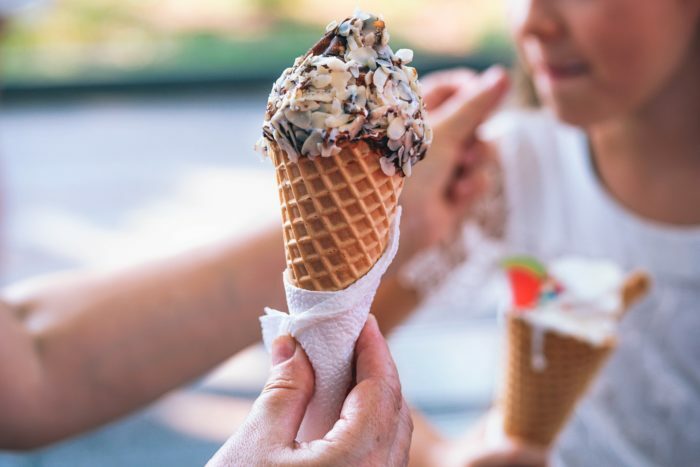 It’s never anything elaborate; a simple trip to the library, park, or ice cream store can create some wonderful memories. You don’t even have to leave the house! Just break out the board games or put on some dance music. Make crafts together and watch their individual styles and approaches to creativity unfold. It’s amazing the spontaneous conversations that can take place during these times, too, which reveal even more of their hearts and personalities. Great opportunities to connect with our kids happen when we’re willing to stop letting the pressure of the to-do list get to us. Since we’re deep in that season of training and disciplining our kids, we often tend to focus on their bad behaviors and overlook the good ones. While we’re busy shaping and molding their character, it becomes really easy to spot those negative traits. Every time we see one, it’s like a bell goes off. Ding! Unkindness. Ding! Selfishness. Ding! Irresponsibility. And we swoop in to provide correction. Unfortunately sometimes, we end up caught in a cycle of negativity where we can’t seem to find anything good about them. We’re always pointing out all the bad stuff, and then they feel bad about themselves so they act out even more. But every now and then, if we’re looking, they do something that is amazing and heart-felt and servant like. Something which reveals that all of our training isn’t in vain. The other day I asked my daughter to clean up the crumbs on the floor near her chair after lunch. She went the extra mile and vacuumed the whole kitchen. A few nights ago a pinched nerve in my foot forced me to stay on the couch, and my son, who had been complaining of a headache and stomachache that afternoon, saw the pain I was in and offered me a pillow to prop up my foot. One child showed initiative, while the other showed compassion. Both showed a willingness to serve. I would have missed the chance to recognize them for these good fruits if I had been too focused on her bad attitude about school work, or his argumentative tone earlier that day. It may be a really bad week, but you can always find something to praise your kids for. We serve a very personal God. The One who runs to meet the prodigal after he (or she) returns home and welcomes them with open arms. The One who sings over us. And we don’t have to grovel in His presence; we’ve already been accepted and chosen. It is incredible to know God feels that way about each one of us. He moved Heaven and Earth to restore our broken relationship with Him, coming down to our level. Our identity comes from Him loving and delighting in us. When we are still and fully realize how much we are loved and enjoyed by our Heavenly Father, we can’t help but enjoy our children! Sometimes, our kids need us to get out of our heads and just give them our hearts. Almost miraculously, a total difference in behavior can happen when we take the time to connect with our kids on their own interests and love languages. There may be a million other things pulling at us, but our children need to know they are a priority, and most of all, they need to know we enjoy being with them! Great post! I’ve been struggling with this lately, it’s soneasy to get bogged down if daily life and forget that we can have fun with our kids too!! Thank you for sharing!! Love this post! It’s so easy to get wrapped up in the to do list and forget what it’s all about. Thank for sharing! Thank you Sarah! That to-do list can really be all consuming and make us miss out on those enjoyable moments to soak up with our kids.